When I make a lasagna, I must cook some meat, add some sauce and spices, layer the noodles with the meat sauce and cheese, then wash a few dishes. When I make two lasagnas, I must cook some meat, add some sauce and spices, layer the noodles with the meat sauce and cheese, then wash a few dishes. 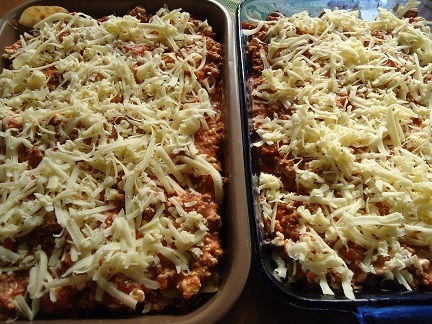 When I made three lasagnas, I must cook some meat, add some sauce and spices, layer the noodles with the meat sauce and cheese, then wash a few dishes. I’ve even made up to eight lasagnas at one time. Even then, my job was to (all together now…) cook some meat, add some sauce and spices, layer the noodles with the meat sauce and cheese, then wash a few dishes. Whether I’m making one lasagna or eight, I dirty the same number of dishes while preparing the food. I take barely any extra time to make extra lasagnas, so for me, it’s a no-brainer. Why would I just make one lasagna when I can make three (or eight)? The same “Cook Once, Eat Twice (or More)” concept applies to almost everything I make – Cheesy Beef and Rice, Corndog Muffins, even these Whole Wheat Waffles. Scroll through all of my Make Ahead Meal posts to get some ideas and recipes that will help fill your freezer with healthy convenience foods. You do realize what will happen though, if you start participating in this “Cook Once, Eat Twice (or More)” system? You will then have a nice supply of healthy, homemade meals to quickly pull out of your freezer and heat up for your family – with little to no effort. Putting a hearty, healthy, delicious meal on the table will become extremely easy. You will no longer be able to use the “I don’t have time to eat or cook healthy food…” excuse. Have you tried the “Cook Once, Eat Twice (or More)” kitchen efficiency method? What are some of your favorite healthy foods you like to make for your freezer? 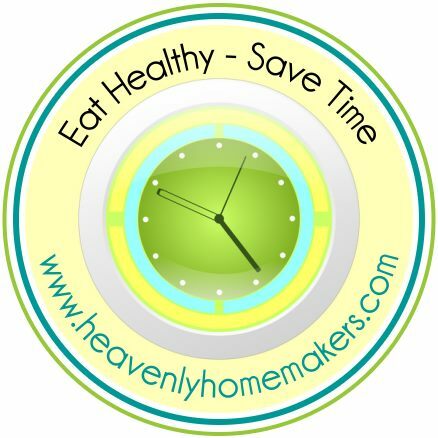 Welcome to my new series: Eat Healthy ~ Save Time. I hope to share many of the time saving ideas that work for me in my efforts to feed my family a healthy diet. As I began jotting down some post ideas for this series, I was shocked at all the many ideas I came up with to share. It would seem that I am the queen of cutting corners and being completely non-fancy. If it isn’t quick and easy to make, I don’t typically mess with it, unless it’s a special occasion. And that, my friends, is why the tips and recipes you’ll find here are all simple and basic. Healthy. Tasty. Fun. But simple. If you want fancy food recipes, you should probably check out a different website. But if you’re looking for easy to throw together, kid friendly, real-food-ingredient recipes…you’re in the right place. Simple is how I roll. My sanity depends on it. When planning meals that will be healthy for your family, try sticking with the basics. All you really need to serve is a main dish and vegetables, and maybe a glass of milk. Don’t over-think it. Don’t make it complicated. Just stick with basic, whole foods. When planning meals and snacks that will be healthy for your family, I believe a lot of stress can be relieved if you simply think about real food. An apple, a slice of cheese, some natural peanut butter on celery, raisins, nuts, a scrambled egg (or three if you are one of my boys) are all great, real food snack options. Are M&Ms sometimes more appealing? Sure. And hey, I’m all for splurging on fun treats sometimes! But don’t tell me that eating a handful of M&Ms saves you time and energy compared to eating a handful of peanuts or raisins. That doesn’t even make sense. See, this is why I think it’s a little silly when people tell me that they don’t have time to eat healthy food. I don’t think it’s always about time. I think it’s often about choices. Healthy eating can be as simple as buying grapes, baby carrots, and your other favorite nutrient packed foods at the store. Take a deep breath and relax. You can do this! 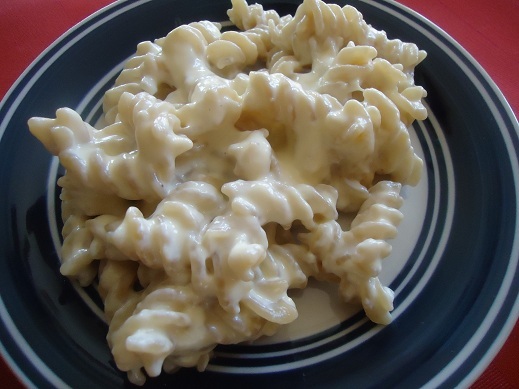 Coming up next in the Eat Healthy ~ Save Time series…I’m planning to do a little Macaroni and Cheese Experiment. I’m going to make a box of mac and cheese, and I’m going to make my Creamy Mac and Cheese recipe. The stop-watch will be coming out, because we’re going to see how long it takes to make each. I’m excited to see if making Mac and Cheese in a more “real food” way takes much (if any?) extra time to prepare and clean up after compared to making a “convenient” box of mac and cheese. I’ll be posting my results for you in a few days! What’s your prediction as to how my experiment will turn out? What are some tips you have for keeping healthy food simple?